Answers to common questions about circuit breaker testing with the CBAnalyzer system. Can I get a demonstration of the CBAnalyzer system? We welcome the opportunity to show you the capabilities of the CBAnalyzer systen. We offer both on-site and web-based demonstrations. Simply contact us at 972-290-0074 or at info@cbanalyzer.com for more information. Is the CBAnalyzer difficult to learn? No, the CBAnalyzer software is not difficult to learn. We have created the system to be simple and for it to be used by every level employee. With that said, we do recommend purchasing Field Setup and Training to ensure successful testing. With this option, an engineer will travel to your facility, train your staff, and load all of your equipment to your account for you. Can I run the CBAnalyzer on my own laptop or tablet? Sure. 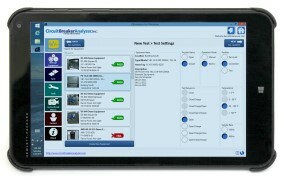 The CBAnalyzer for Windows software program can be run on any tablet or PC that meets our minimum system requirements. To check your system requirements, see the pricing page. We'll need an accelerometer to use with our tablet or pc. What's available? Each CBAnalyzer package includes an accelerator, so there's no need for you to purchase one. How does the CBAnalyzer system measure first trip time? The system will measure the first movement and capture the peak amplitude of the contacts parting and stopping. From that data we can determine whether the first trip time is within manufacturer's specification. How does the CBAnalyzer system tell if the breaker is OK or has an abnormal condition? The system includes an Account Manager which includes stored profiles for all types of circuit breakers. 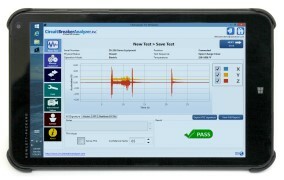 After the system has recorded a vibration signature, it uses advanced algorithms to compare the test results with the stored known good profile (KGP) signature for the same type breaker. It then indicates whether the breaker's test was within the parameters for a "good" breaker. For additional information about KGPs, please visit the videos page to view an explaination of the concept behind the KGP. What do I do if my breaker is found in an abnormal condition? There is a remediation section in the CBAnalyzer Account Manager where the user can get the guidance needed to handle virtually any issue. Can you help determine why my breaker is operating incorrectly? Yes. We have profiles and breaker plots stored that have all types of failures. CBAnaylzer support personnel can point you to the correct problem in your circuit breaker's mechanism, thus saving you time and money. How often do you recommend testing with the CBAnalyzer system? Because testing with the CBAnalyzer system is a very simple process, we suggest that you test whenever you have a breaker offline or have access to it while doing switching. Exercising and testing the breaker is the best way to insure the breaker will operate correctly when called on to do so. What is the report turnaround time? Almost instantly whenever the test is synced with your online CBAnalyzer Account Manager. The report is transmitted back to the user's computer or tablet in a few seconds and is also stored in your CBAnalyzer Account Manager. Can we use the CBAnalyzer system for other electrical applications? Yes, it can be used with any device that has a vibro-mechanical profile: switches, contactors, transformers, transfer switches, even inverters and servers can have a profile. Can we use the CBAnalyzer system for non-electrical applications? Yes, it can be used with anything mechanical using the TFA mode. Using your CBAnalyzer Account Manager, you can set your own known good profile. You can then compare your equipment's profile anytime you wish, quickly obtain test result feedback, and store the test data. Can we check to see if our accelerometer needs calibration? Yes, there is a calibration check tool in the CBAnalyzer software. You can find this tool by selecting the "Tools" icon. On the lower, left-hand side, you will see the Calibration icon. Using the calibration check tool will provide you with information such as the date of the last calibration check for that accelerometer and the last calibration check result. We also have a video on how to use this tool. Please note that the calibration check tool cannot calibrate your accelerometer. Actual calibration of your accelerometer is done by the manufacturer. If your accelerometer failed the calibration check, you can call us at 972-290-0074 for information on how to send your accelerometer in for calibration. Will the breaker's vibration or arcing cause damage to my computer or tablet? No, it will not be damaged. Can other people/companies see my equipment, tests, or information? No. We take privacy very seriously and have taken extensive measures to ensure complete confidentiality. 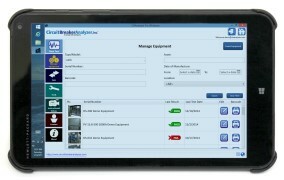 No one will be able to see your equipment inventory, tests, or information. Likewise, you will only have access to your own company's details. How much does the CBAnalyzer system cost? Go to this page for complete pricing information..
We recommend that you start by watching our videos to learn more about the complete Circuit Breaker Analyzer system. You can also call us at 972-290-0074 or email us at info@cbanalyzer.com to speak to a customer service representative about your application. If you have additional questions or want a demo, don't hesitate to contact us.